Ascot Farm in Miami is located off the Florida Turnpike in the southern end of Miami Dade county. The farm offers a riding academy with horse boarding, horseback riding lessons, training and sales. Ascot is able to offer instruction from beginner to advanced whether you are are learning to perform in horse shows or just starting out on a horse. The farm's Hunter Ponies are all different sizes and are all champion show ponies. Lessons begin with learning about how to be safe around the horses and ponies, then applying safety when riding. Lessons are available to children from age 2 to adults under 240lbs. Once a rider has excelled in their jumping and is ready to advance over higher than 2' fences they will need to invest into a horse/pony of their own. Lessons are a minimum of twice a week and are one on one private lessons. The Pre-School lessons are for ages 2-5. Young riders learn about safety on horseback, as well as the names of the equipment and parts of the horse while being led around the arena for their 15 minutes of fun and learning. The children progress with each lesson and may advance into the full 30 minute sessions. Contact Ascot for current pricing. Bike & Roll Miami offers segway and bicycle rentals at three different locations in Miami. They can be found across from Bubba Gump Shrimp at the Bayside Marketplace. South Beach locations are on Collins and over on Lincoln Road. Bike & Roll supplies you with the newest Segways available, the i2. The Segway River Tour takes you along the Miami Riverwalk which is a paved easy path with views of the Bay. See the famed ancient Miami Circle that was carved into the Florida bedrock over a thousand of years ago or enjoy the more recently historic Fort Dallas Park that played a role in the Seminole Wars. If South Beach is more your style, try taking a tour around the Art Deco District and step into the retro-chic world of International celebrities and gourmet cuisine. Stop at the beach to run along the sand or take a moment to pop in the nearby shops and boutiques. The Bass Art Museum and Holocaust Memorial with it's dramatically striking message are all nearby. For a more romantic option, take the South Beach Sunset Tour and watch the twilight dance across multi-million dollar mansions and gorgeous shorelines. Segways can be rented for the tours and for $10 more you can rent them for the entire day. Tours last from 1-3 hours each. Remember to wear closed toe shoes for safety. Bird Bowl Bowling Center is nestled in South west 40th street Miami in Florida and has plenty to keep you entertained. The bird bowling establishment is a 60 lane bowling center that offers an automatic video scoring platform together with some nightly specials. Bird Bowling also has 16 billiard tables, an arcade and a lounge. This place is known to present numerous bowling party packages while at the same time, hosting all year round leagues and summer camps. Besides being quite reasonable as far as the cost of bowling is concerned, this place also offers some crazy deals such as free bowling for ladies on some days. Plus, if you are a social person, then you will meet all sorts of people, from young to old as well as families with kids trying to learn how to bowl or just out for a good time. Consider a night out with just the adults and enjoy the DJ, bar, and music videos. At night, they will turn down the lights, turn up the music and play lots of entertaining music videos for people to dance, listen and enjoy. If you get hunger, there is food onsite with pizza, other typical bowling alley foods, drinks and beers. Birthday Party packages are $19.99 plus tax per child and included 1 1/2 hrs. of bowling, food and arcade. As part of the package you will also enjoy a party hostess and DJ, $5.00 toward arcade games for each child, and invitations. Other items such as favors are available at an additional cost. Party packages are available on Saturdays & Sundays from 2:00 PM- 4:00 PM or 5:30 PM- 7:30 PM. Please check with Bird Bowling about current pricing. Gator Park Airboat Tours located in Miami, Florida, in Miami Dade county, is an all out extreme adventure the whole family can enjoy. You will voyage deep into the Florida Everglades, and encounter a unique world of alligators, turtles, snakes, exotic birds and fish. The Everglades National Park is famous for its diverse wildlife where visitors get to experience everything from endangered birds and rare species of animals to snakes and the Florida panther. Once you take an airboat tour, you will learn why these animals call the Florida wetlands home, and the professional guides will teach you and show you a side of Florida you have never seen. On top of the tour, there are other exciting activities to be taken in on a trip to Gator Park. You can view professionals wrestle alligators, and if you can brave it yourself, hold a baby alligator. By taking part in an everglade safari, you will come up close and personal with some of Florida's best animal specimens. With so much to do, your whole family will be entertained all day. Their are normal tours, private tours, safaris and even a history of alligator wrestling as done by the Seminole Indians. There are also great educational events about the Miccosukee Indians as well. Gator Park also has their own restaurant, specializing in such items as alligator tail sausage. There is also an alligator and Everglades themed souvenir shop to grab that special item to remind you of your trip. This is a great place for vacationers to South Florida as they also have camping areas and RV parking. Prices are very reasonable as well with a variety of discounts for children and seniors. South Florida has a variety of great destinations, and fun experiences, but very few are as unique as Gator Park. With alligator tail meat in it's resturaunt and educational opportunities galore, it's a must visit. 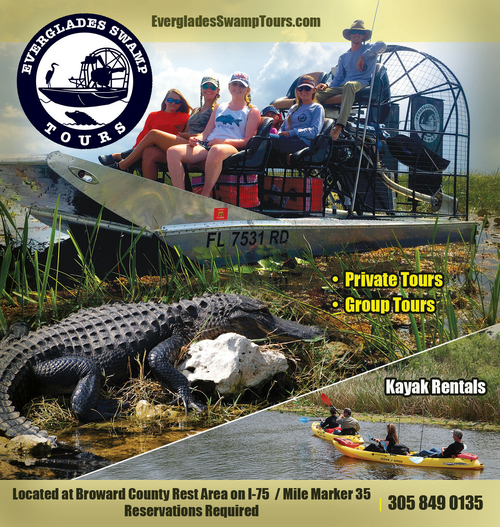 Whether you take an airboat tour or go on an Everglades safari there is something to enjoy for everyone. Jesse Williams Ranch in Miami provides a unique opportunity for your family to have first hand experience of life on a farm. Families can escape to the ranch, located in Miami Dade county, to escape the hustle and bustle of every day life and reconnect with nature. Jesse Williams Ranch in Miami offers educational programs, horseback riding lessons, and a number of activities created for family enrichment, personal growth, leadership and team building. The farm is always a big treat for the entire family with everything from household cats to panthers, sloths, zebras and more! This family run ranch in the heart of Miami horse country is sure to please your animal lover! Our award winning school horses will work gently with students to help them develop an understanding of horsemanship. Our instructors are available for private lessons where you will learn everything about taking care of one of these beautiful equines. Students will learn everything from grooming and handling, to tack and equipment, to riding and creating a bond with these magnificent creatures. Visitors are welcome to watch at the rail as the students of all ages master the different styles of riding. Small groups and large parties interested in riding can be accommodated as well. At Jesse Williams Ranch in Miami, our commitment to educating about wildlife translates into a three hour program that allows your party to spend time touring the ranch and participating in hands-on learning. The program also includes a picnic lunch and plenty of time for exploration and games. This program is targeted for children in kindergarten through 5th grade. Educational parties are also available if your child is celebrating a birthday. Hosting your party at the ranch offers an unforgettable experience unlike any other. The party package includes activities led by specially trained staff and volunteers and can support between ten to fifty children. Party options include a petting zoo, exotic animal displays, pony and horse rides, games, and take home photos with exotic animals. Other programs at the ranch include exceptional needs and youth enrichment programs that are designed for students with learning disabilities, speech impediments and impairments. Are you an "Adrenaline Junkie"? Love to get a thrill and think roller coasters are wimpy? Jet Boat Miami offers exhilarating tours with crazy twists and spins as you hop around Miami's islands and homes of the rich and famous! Jet Boat Miami takes you and your family on the ride of a lifetime doing 360 turns, side drifting and high speed cruising. See Sea Isle Marina in the beautiful Key Biscayne Bay and then head on to San Marco Islands and Memorial Island. Route and duration subject to change depending on weather conditions. Tours are offered daily at 11:00 AM, 1:00 PM, 3:00 PM, and 5:00 PM. Fees are $29.95 for Children over 12 and Adults. Children under 12 are $15.94. Tours can be reserved online. Times and prices are subject to change.